Get Lit: If you're interested in neon, ya got tours and ya got books. If you want to learn the craft of making a neon sign, or want to try your artistic hand at neon sculpture, this may the workshop to try. 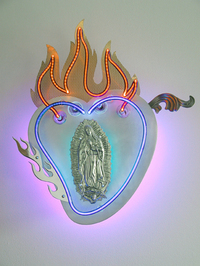 Lili Lakich, is again holding her Saturday afternoon 8 week Neon Art Workshop at her Arts District studio beginning this February 25. I'm sure there's always room for one more. The class is $350, plus materials that can range from $75 to $200, depending on what your design is. It ends with an exhibition for family and friends. For info, call (213) 620-8641.